If you’re going by the calendar, spring officially arrived on March 20th. But most years here in northern Minnesota, that’s kind of a laugh. As a general rule, there’s still plenty of snow and chilly weather without much hope of green growing things. Some years we’re lucky and get an early thaw. For the most part though, we have to watch in envy as our southern friends post pictures of their gorgeous spring weather. But that doesn’t mean that we can’t enjoy spring-inspired cooking! In fact, changing the way I cook by the calendar and not the weather makes this in-between time a bit more bearable. This Spring Puff Pastry Tart is a wonderful way to usher in the season. It has some lovely, fresh flavors from the asparagus, pesto, and green peas. Let me show you how it’s made. Here is the short list of ingredients: puff pastry (of course), cream cheese spread, Parmesan, prosciutto, asparagus, pesto, and frozen peas. Simple, yet full of flavor! If your asparagus is really thick, slice it in half lengthwise before chopping. You want it to be able to cook quickly in the oven. I used arugula pesto because it’s cheaper than making basil pesto. But feel free to use whatever kind you please. Also, I’m pretty sure you could use regular cream cheese instead of the spread—it’s just easier to not have to bring it room temperature before using it. Start by rolling the puff pastry out on a piece of parchment paper to about 10×15 inches. It’s okay if you can’t get it to roll out quite that big. And then peel it back off of the puff pastry. If that makes sense. Next, cut off a thin slice all along the edges of the tart. You can save these slices and bake them along with the tart as a little snack. Pierce the pastry all over with a fork to prevent it from puffing up too much in the middle. Bake in a hot oven until it starts to go a nice golden brown color. If the pastry puffs up too much in the middle, just poke it back down with a fork. Smear the cream cheese spread over the warm puff pastry in dollops. Add the pesto in the spaces between the cream cheese. Add the prosciutto, asparagus, and peas. Bake for an additional 10–15 minutes, or until the pastry is cooked through and the asparagus is tender-crisp. Allow to cool enough so you don’t burn your mouth when you devour it. Serve warm. Now, you don’t have to stop here with the flavor combos. You can use this basic method for creating the puff pastry form, and top it in many different ways! I’m curious: What is spring like where you live? Let us know in the comments! The post Ghirardelli Dark Chocolate Microwave Brownie Mix, reviewed appeared first on Baking Bites. 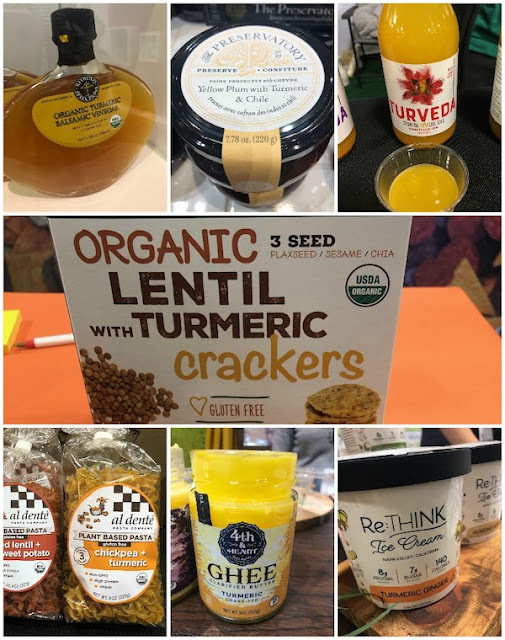 The Winter Fancy Food Show is a great place to identify trends. It’s also a way to see how trends are evolving. Here is a short list of what caught my attention. Cauliflower is everywhere! This isn’t new and you’ve probably seen cauliflower rice in stores. From the Ground Up makes gluten free pretzels and crackers from cauliflower. I wasn’t crazy about the pretzels, but the cheddar crackers taste a lot like Cheez-its. The other brand I liked was Caulipower. They make gluten free cauliflower pizzas, pizza crusts and tortillas. They each have the right texture, something I found lacking in other brands. I wrote about mushrooms before but this year I saw even more innovations, including snack bars with mushrooms, from a brand called Shrooms offering a sweet and savory version as well as one with chocolate. 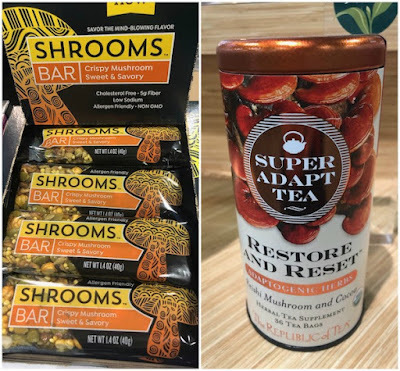 Mushrooms are also showing up more in tea and coffee including one from the Republic of Tea called Restore and Reset that combines Reishi and cocoa. Long a favored ingredient in skin care, collagen is moving into food. I saw it in fuel bars and drink mixes from the Paleo focused Primal Kitchen, teas and added to random products like a sweet and creamy “granola butter” from Kween. Will ingesting collagen peptides help support healthy joints, tendons, and muscles, skin, hair, and nails? From what I’ve read, the jury is out. One of the coolest things I noticed at the show this year were all the new ways food is being packaged, new form factors in particular. 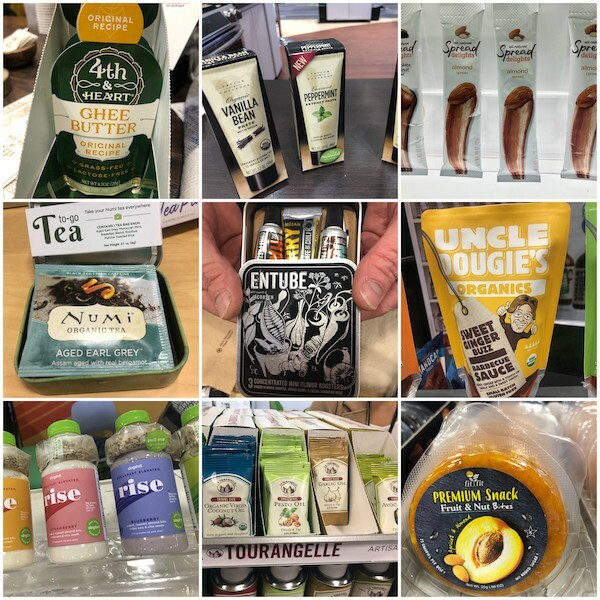 Lots of individual packets of things like ghee from Fourth and Heart, extract pastes from the British company Taylor & Colledge, nut oils from La Tourangelle. Remember the Altoids tin? It’s back but ingeniously filled with teas for travelers from Numi, and with tubes of curry and harissa from Jacobsen Salt. Fit Fit Bites offers fruit snacks in little pucks. Uncle Dougie’s solves the frustration with barbecue sauce bottles by packaging their product in a squeeze-able pouch. Another cool innovation is the Slingshot with chia granola to add to an accompanying yogurt based drink. Hummus has been trending for a while, but now in addition to being available in tons of flavors, it’s showing up as an actual ingredient. 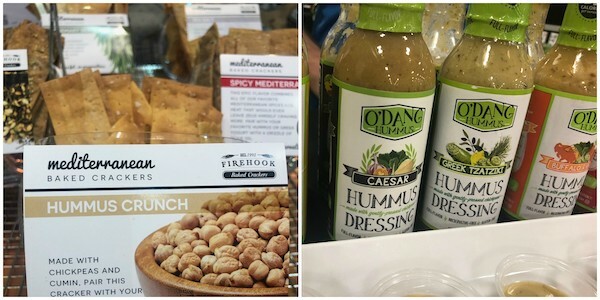 A couple of examples include Firehook’s hummus crackers and O’Dang hummus dressing which comes in a variety of flavors. Turmeric is another trendy ingredient. This year I saw it in ghee, in “shots” that a coming soon from Numi, in a particularly delicious hummus from Blue Moose of Boulder, in tonic from Turveda, in crackers from RW Garcia, in bone broth from Nona Lim, in pinchetti pasta from Al Dente Pasta, in ice cream from ReThink and even in Ritrovo balsamic vinegar. Frico is a cheese crisp from Italy, traditionally made from heating Parmigiano Reggiano until it melts and forms a thin crust. 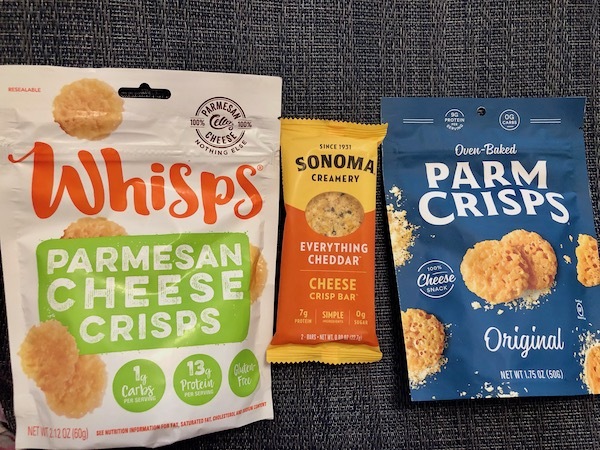 But companies have created products that mimic this treat, Sonoma Creamery, Whisps and Parm Crisps were a few I noticed this year. Crunchy, cheesy and available in a variety of flavors and shapes, these snacks are gluten free, low in carbs, high in protein. 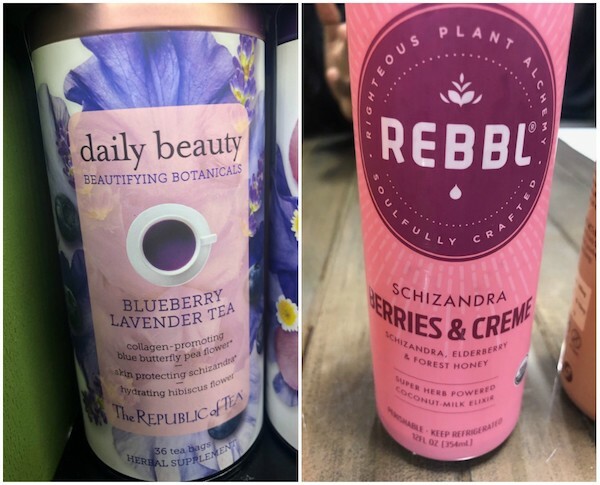 Schizandra which sounds like the name of a Disney princess, but is really a berry and showed up in an elixir from Rebbl called Schizandra Berries & Creme as well as in the Daily Beauty tea from Republic of Tea. It’s used in traditional Chinese medicine for and is adaptogenic, which means it supports the adrenal system and combats stress on the body. It supposedly tastes sweet, sour, bitter, pungent, and salty. You know about probiotics, but what about prebiotics? Prebiotics complement probiotics, basically providing food for probiotics grow, which in turn help promote better digestive health. When you see prebiotics on labels it means generally some kind of fiber. 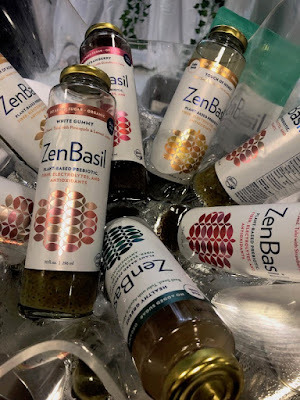 My favorite prebiotic product was Zen Basil, a line of organic drinks made with basil seeds. Basil seeds are similar to chia seeds, they plump up when added to liquid but compared to chia seeds they have more iron, fiber, potassium and calcium. Used in ayurvedic and Chinese medicine they purportedly have antioxidant, anticancer, antiviral, antibacterial, antispasmodic and antifungal properties. The drinks which are made from a family recipe are fruity, juicy and delicious. They also offers bags of the basil seeds. Last but not least, I don’t remember seeing eggs at the show before. 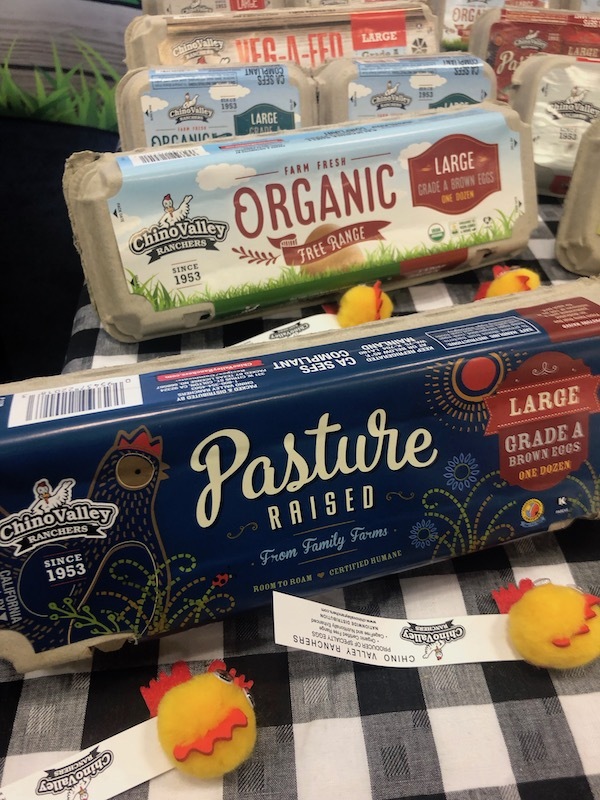 This year several companies were featuring eggs from pasture raised chickens. ©2019 Cooking with Amy. All rights reserved. This material may not be published, rewritten or redistributed without permission. LIFETIME 100% MONEY BACK GUARANTEE – We’re so confident that you’ll love the KITCHY pizza cutter that we’ll refund every penny if you don’t like it! Actually, most customers like it so much they buy more than 1 and give it out to their friends and family! The Ninth Edition of Professional Cooking reflects the changing nature of our understanding of cooking and related fields such as food safety, nutrition, and dietary practices, as well as new thinking about how best to teach this material. What has not changed is the core material that focuses on the essentials–the comprehensive understanding of ingredients and basic cooking techniques that are the foundation of success in the kitchen, and the development of manual skills to apply this knowledge. Making the most out of the most important meal of the day, the Holstein Omelet Maker makes two fluffy omelets in just a few minutes. Just pour in your mixture and close the lid. The Omelet Maker has a non-stick coating for easy clean up and upright space saving storage. Its non-slip base makes for safe cooking and its indicator light lets you know when it is ready to start cooking. Holstein’s Omelet Maker simplifies life in the kitchen and makes everyday cooking and entertaining easy. To clean, simply use a damp, non-abrasive cloth to wipe down the maker after each use. To extend the lifespan of the non-stick it is recommended to cover the plates with cooking oil every so often. The Fancy Food Show provides a terrific opportunity to discover new and delicious things. Some of these things are new, some are just new to me, but all of them are worth seeking out. Satsumas are a tangy sweet hybrid citrus fruit. 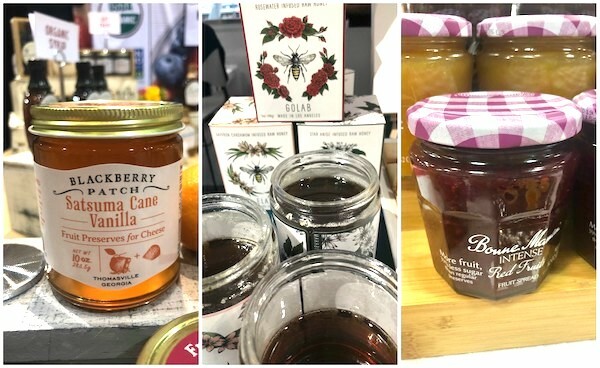 Blackberry Patch has recently introduced three satsuma products, a syrup and two preserves intended to be served with cheese. The Satsuma Cane Vanilla is also delicious as jam on toast. It’s very intense and juicy. I’ve had honey infused with different ingredients including lavender and citrus, but I’ve never had any as heady as Makabi & Sons, rosewater infused honey. Based in Los Angeles, they also make beautiful boxes of gourmet cookies, but it was the honey that really won me over. They also make cardamom honey. If you’ve been to France you’ve no doubt seen that the supermarket brand Bonne Maman has a much larger line of jams and preserves available there than they do here. In France, you’ll find flavors like pineapple with rum and vanilla as well as Mara Des Bois Strawberry. At the show, they were introducing a new line called “intense” and I loved the Red Fruit Intense. Looking online I now I see they are offering Strawberry Intense instead which includes some black currant juice. Might it be the same thing as Red Fruit? I’ll have to buy a jar to be sure. The Intense line has less sugar than conventional jams, and true to the name, a more intense flavor. I wish I could tell you that Liege waffles were trending, but I only saw two companies exhibiting them at the show. Mountain Waffle Co. sells wholesale and Belgian Boys sells retail. What sets these waffles apart is their crunchy almost crackly texture thanks to the inclusion of pearl sugar that does not melt. Belgian Boys offers plain as well as chocolate covered Liege waffles. Roons are definitely the best macaroons I have ever tasted. They are moist inside, toasty and crunchy on the outside and dipped in Guittard chocolate. Smaller ones called Lil Roonies are completely coated in chocolate, the espresso chocolate ones are particularly good and are “coming soon.” Right now most of their macaroons are available primarily in Portland OR or online. Choffy is a product developed by an engineer who had a dream about chocolate that could be brewed like coffee. After three years of experimentation, he found a way to make it work. It tastes a bit like chocolate but also a bit like coffee. It’s good black or with milk or sugar if you prefer. The ground roasted cacao also can be used in recipes. I really like sweet treats with a bitter edge. Infusions are a line of chocolate covered almonds from Canada with tea. They start with crunchy roasted almonds cover them in toffee, dip them in chocolate and then coat them with powdered tea—matcha, rooibos or raspberry rooibos. The matcha is my favorite. Available at Costco in Canada, I hope they make it to our side of the border. Good Catch fish free tuna tastes like tuna, not just the texture of tuna, but also the flavor of tuna. It’s high in protein, made from plants and in particular a blend of peas, chickpeas, lentils, soy, fava beans and navy beans along with algae oil which gives it a fresh from the sea flavor. It’s just launching in stores now. Ramen noodles from Sun Noodle. I’ve known about Sun Noodle since I started writing about ramen. I’d say the majority of ramen shops in the US use noodles from Sun Noodle. Their base line includes 200 different formulas, but of course, each restaurant generally puts their own twist on it. Now you can find fresh ramen noodles from Sun at many Japanese specialty grocery stores and even at some Whole Foods stores. You may have seen egg bites, the little souv-vide cooked eggs at Starbuck’s. I go to Starbuck’s so infrequently I hadn’t seen them but I tried the version from Trois Petits Cochons and was impressed! They are tender and flavorful and come in a variety of flavors including bacon and swiss and prosciutto and gruyere. I eat a lot of almond butter. But I had never had walnut butter until recently. Walnut butter from Wellnut Farms has a bit of sugar and RSPO certified palm oil but it’s generally pretty healthy. The sugar is necessary to cut the bitterness. I might try making my own with a bit of walnut oil. Angkor Cambodian Food is a food company started by two ex-engineers. They have a whole line of Cambodian sauces, but my favorite is the award-winning lemongrass paste. It’s a beguiling blend of lemongrass, garlic, onion, jalapenos, fish sauce, galangal, lime and lime leaf, and a few other things. Use it for stir frys, marinades or even as a soup base. Muso from Japan produces a line of umami products—hot sauces, miso pastes and more. They add a savory quality without seeming overly salty. Most of their products are organic. If you’re interested in specialty Japanese ingredients, check out their booklet. Some of their products are available on Amazon, but only one umami paste. I hope they find distributors and more of their products become available soon. Smoky red mustard from Freak Flag is a unique condiment that has notes of garlic, tomato and mustard and a balance of honey and vinegar. But it needs another name. Heinz is selling a mayo-ketchup combination called “mayochup” so maybe “mustup”? Red Duck makes condiments and their latest ones are taco sauces. If you love Korean tacos, you’re in luck. Their Korean Taco Sauce is definitely my favorite, and is good in a taco or quesadilla but I imagine it would be good in a marinade for meats, in meatloaf, chili or in a gooey bean dip. I’m looking forward to experimenting with it. Chile crisp is having a moment. It’s a Chinese condiment that has gotten a lot of press with plenty of copycat recipes online. Don Chilio offers basically a Mexican version that consists of thin slices of chile peppers fried to a crisp in olive oil. I tried the jalapeno but they also offer a habanero and serrano version. It’s super crispy and plenty spicy. I’d eat it by the spoonful. It’s heavenly over a slice of cool avocado. 1. Every HOUSMILE product includes a 30days money-back Guarantee! 2. Please kindly contact us once when you get trouble with our product. ☆FDA APPROVED & HEAT RESISTANT – Made of premium thick 1.00mm stainless steel and 100% FDA Grade and BPA Free silicone for durability, heat resistant 450F, stain and odor resistant and very hygienic. ☆NON STICK & DISHWASHER SAFE – Ergonomic silicone handles grips & non-stick silicone tips offer you the best control on food, good for professional chefs and amateur cooks alike,dishwasher safe. ☆PULL-RING TECH & SILICONE HEADS – Locking clip in close ,large hanging loop “O”Ring for convenient air-dry and storage, non-detachable silicone heads to prevent the buildup of bacteria. ☆100% SATISFACTION GUARANTEE – Ideal for both household and outdoor use so perfect for buffets, parties, barbecue, picnics and camping trips! 60 days money-back and 24-month worry-free Guarantee.